Two new photos have arrived from jOBS, director Joshua Michael Stern's biopic on American entrepreneur and Apple Inc. CEO Steve Jobs. 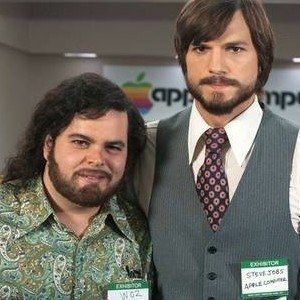 Here, we get our first look at Josh Gad as Steve Wozniak standing alongside Ashton Kutcher as the title character. Steve Wozniak, known as The Woz, is an American computer engineer and programmer who co-founded Apple Computer. He single-handedly invented the Apple I computer and the Apple II computer in the 1970s. These computers contributed significantly to the microcomputer revolution.